Anthony Jones, Jr. was born Sept. 21, 1933, to Anthony, Sr. and Pearl Jones. He and his brother Kenneth grew up in Fort Greene, Brooklyn, where they established many lifelong friendships and he became an avid softball player. During this time, he lived next door to the young lady who would become his wife of 62 years, Arnoline Whitten-Jones. He attended Boys High School in Brooklyn, graduated and went on to New York University to study pre-med. He was a member of Kappa Alpha Psi fraternity and graduated with a BS in biology. He then went on to get his MA in Education. After college, Tony, as he was called by all, worked for the U.S. Post Office. He then moved on into the field of education and taught grades 6 through 8. After years of working in the educational system, he went into the Manpower Program, which was responsible for recruiting minority entrepreneurs. He also worked very diligently with the Bedford Stuyvesant Restoration Corporation as a Community Developer. Ever mindful of the importance of a strong community, Tony also worked with the New York City Police Department as Director of Community Affairs. This is the post from which he retired. Upon his retirement and relocation to Sarasota, Florida, Tony became a member of the Monday Golf Group at the Bobby Jones Golf Club. He was also one of the founding members of the Gulf Coast Community Choir. Most important to Tony was his involvement with St. Wilfred Episcopal Church. He, along with his wife Arnoline, enjoyed the fellowship and spiritual guidance of the St. Wilfred Church Community. Tony enjoyed participating in the church pageants. Being St. Nicholas, during Christmas, was a joyous occasion in his life. He also volunteered his services to the local Sarasota Police Department and the NAACP both with which he was able to continue his community relations endeavors. 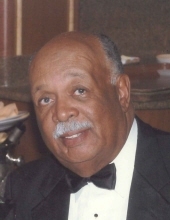 He is survived by his wife, Arnoline Jones; his brother, Kenneth Jones; sisters-in-law, aunt, countless nieces, nephews, grandnieces, grandnephews, cousins and a host of friends. Though he will be missed by all, we know that he moves on to join his parents and beloved children, Leslie and Tony, to bask in the glow of the loving presence of our Lord. To send flowers or a remembrance gift to the family of Anthony Jones Jr, please visit our Tribute Store. "Email Address" would like to share the life celebration of Anthony Jones Jr. Click on the "link" to go to share a favorite memory or leave a condolence message for the family.